Counterfeit. have just revealed a lyric video for track Close To Your Chest. It comes just one month ahead of the band’s debut album release, of Together We Are Stronger. Counterfeit. put the lyric video together themselves, and you can watch it here. The band are to release their debut album Together We Are Stronger on 17th March, via Xtra Mile Recordings. It will be available to buy in both CD and vinyl format, and to stream and download at all good digital and streaming platforms. The 10-track album was produced by Thomas Mitchener (Frank Carter & The Rattlesnakes, Dead!) and recorded at Broadfields Studio. 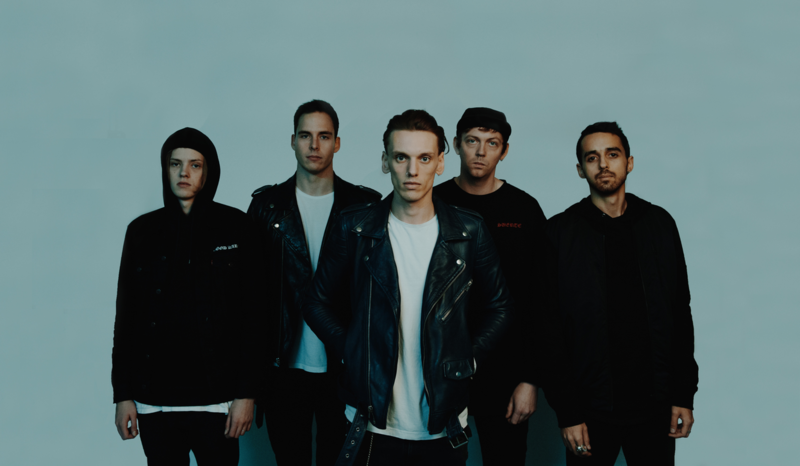 Together We Are Stronger is full of punk-rock flair and showcases front-man Jamie Campbell Bower’s raw and honest vocals. Pre-order the album below. The punk-rock five-piece embark on their Spring European/UK tour on 24th March in Hamburg, and work their way through cities including Berlin, Rome and Amsterdam, before hitting the UK. Counterfeit. will then head to Leeds on 18th April and wrap things up in Brighton on 29th April, before playing London’s Underworld, on 26th April. They will be joined by five-piece Tigress for the UK & European dates, and Southampton-band Faux, for the UK dates. Full tour dates and details where you can buy tickets, can be found here.